Photographer, filmmaker, and multimedia artist Douglas Gayeton has a show opening this weekend in Petaluma, California (Singer Gallery, August 18th, 5-7pm.) I've been a fan of these beautiful works since I first saw them a few years ago. They're dazzling full-size, and these tiny jpegs can't possibly do them justice. But I'm posting a few in this post, kindly shared for BoingBoing readers with Gayeton's permission. Click on any image for a larger JPEG, so you can read all the little text. Above: a photograph of the oldest living "buttero" or Italian cowboy. It was taken in Maremma, an area in southern Tuscany. 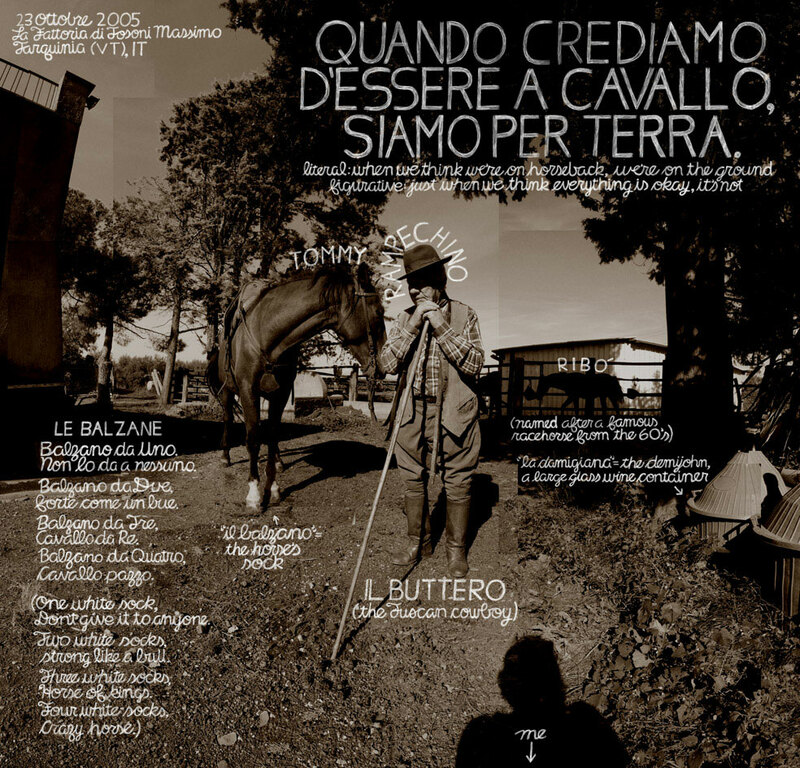 (QUANDO CREDIAMO D'ESSERE A CAVALLO, SIAMO PER TERRA  100x100cm (39x39in) Lamda print / Kodak Endura paper). 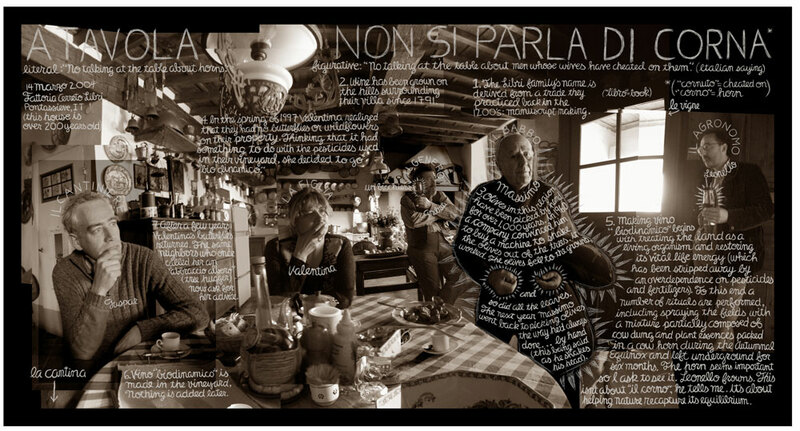 Douglas Gayeton has explored Tuscany and the heart of Italy's "Slow Living" culture since the early 90's. 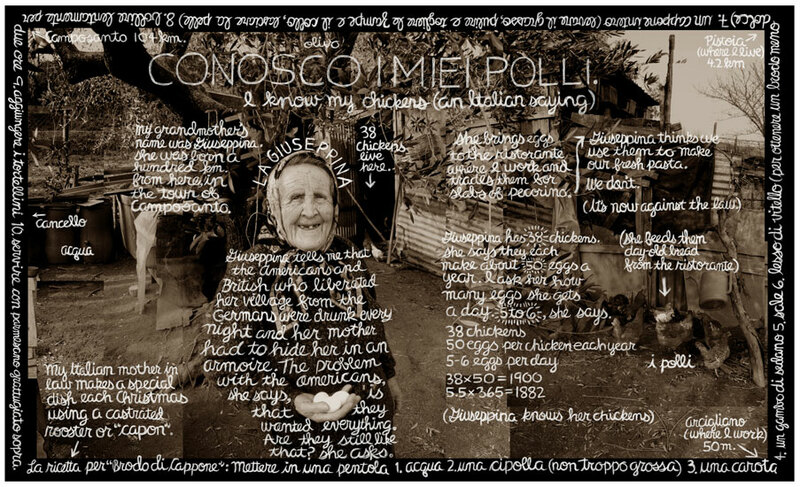 With a keen eye for stories and an ear for Italian dialect, he he intertwines the literal with the figurative in a photographic approach he calls the flat film. To become immersed in one of these works is to experience a world where time is at once collapsed and expanded. Regarding his work process, Gayeton says, "I've always seen photography as being about a single moment, whereas film is about orchestrating a sequence of moments (scenes) to create a larger narrative. "As a filmmaker who also shoots photographs, I try to document an event while it happens, not as one moment, but more from a cumulative standpoint. The concept of stories evolving over time is very important to me. In fact, many of my images are comprised of multiple photographs taken over the course of hours or even days. Others photographs capture a single moment from different vantage points. In this way I both compress and explode time. "After shooting, I go into my "editing room" and build my story, which often takes the form of writing. This began, incidentally, as a personal record, a way for me to remember phrases overheard while I was shooting or specific cultural data, but lately the stories people tell me have become a major part of the work." More of his work here, as well as here on PBS's website (that project won a Webby for Best Broadband site/ 2004). He documented the making of biodynamic wine for Time magazine earlier this year. Gayeton is also the the Chief Creative Officer at Millions of Us. Special thanks to Melanie Cornwell for turning me on to Gayeton's work back in 2004.